This article on Rail Technology Magazine is entitled RMT Backs Disabled Passengers Protest In London. I will not comment directly on the article, but relate an incident, that I observed on Saturday, as I was travelling to Brentford station, to see Ipswich Town at nearby Brentford. I was travelling in the fourth car of a ten-car formation of two five-car Class 707 trains, when we stopped at a station and seemed to be waiting a long time to depart. I then noticed a guy in a motorised wheel-chair moving along the platform, who stopped at the door at the front of my car. The guard then appeared on the platform, said something to the guy in the wheelchair and entered the train. He returned a couple of minutes later holding the folding ramp, which he used professionally to load the guy and his wheelchair into the train. A couple of minutes later after stowing the ramp, the guard closed the doors and gave the signal to start. This picture shows the height difference at Brentford station. This is not as bad as some train-plarform gaps, but why isn’t it flat? A station-man on the London Overground once told me, that loading disabled passengers on to trains using a ramp, is a major source of delay. Saturday’s incident illustrated the problem beautifully. South Western Railways use a very inefficient system. The guard had to walk some way to load the passenger, as he happened to be at the back of the train. He was actually in the second train, so had to walk on the platform. The ramp had to be removed from and replaced in its cupboard. How many times, do guards and station staff catch their fingers in the ramp? 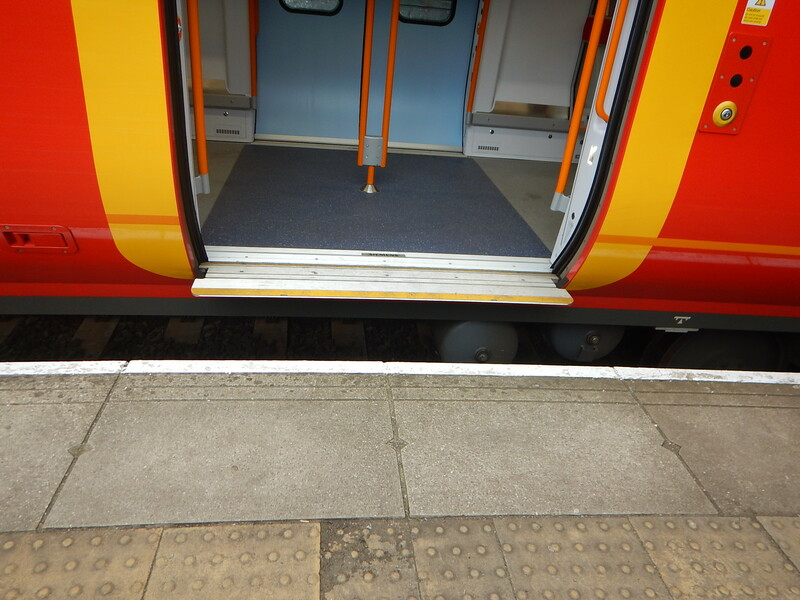 If level access were to be provided between train and platform, the guard would just have acted as a guide to get the guy in the wheelchair on the train. South Western Railways are getting a new fleet of Class 701 trains. These trains will be walk-through, meaning the guard can get to where assistance is needed easily. And in the dry, if it’s raining hard. Will the trains floors, be level with those of the platforms? If not, will a Harrington Hump be provided? Surely, this will mean many disabled in a wheelchair, like an acquaintance of mine, will be able to push or drive themselves into and out of the train. It will of course help others like those with an infant in a buggy or dragging a heavy case. Let’s hope the new fleet of trains, will be designed to access the trains in a much better way than the current Class 707 trains, and the older Class 455 trains. Could this incident illustrate the problems, that prompted South Western Railway to decide to return the Class 707 trains to the leasing company? Does what I saw , have any relevance to the role of guards on trains? The incident I saw, would have required assistance from a second person, even if the access had been totally level. London Underground and Overground try to always have somebody on the platform, when a train is in the station. The Docklands Light Railway always have someone on the train. South Western Railway could use either method.